Do you want to make up a few baby gifts but need some inspiration? Today I am showing you what I’ve been making for a few pregnant friends and giving you a FREE Cut File! Oh, and lets not forget it’s also a Silhouette Challenge Day! So at the bottom of the post you will find a link up of kid related projects that you can make with your Silhouette Machine! My favorite baby gift lately has been this Welcome Baby Snap Shirt. I’m so in love with it that I want to give it to you to use for your friends and family! If you are using more then one color you will cut & iron it on separately. Since mine was all back I cut on the smooth HTV setting and ironed it at one time. or maybe something for the newly promoted big sister and baby?! And that’s not all today’s post had in store. It’s also Silhouette Challenge Day! 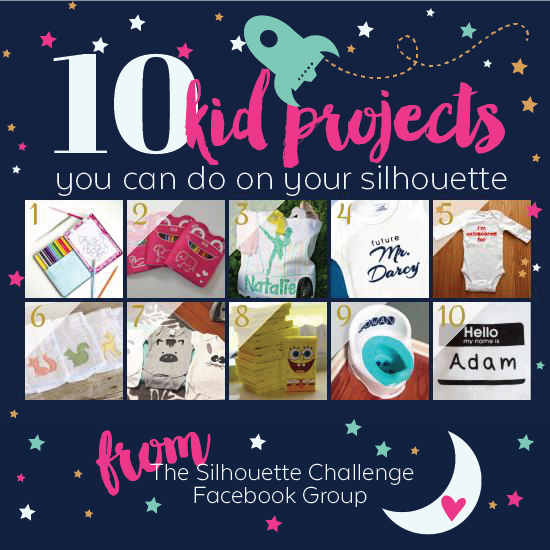 And this month’s theme was anything KID related, so check out my friends below for some more ideas on things you can make for your kiddo with your Silhouette Machine! Well that makes 4 out of 10 of us making baby onesies for the challenge. I am happy to be in such great company. I love the hello my name is onesie! That would be a perfect way to announce a baby’s name. hahahaha there’s just something about a onsise that makes us all want to vinyl it! Very cute! Love the “Hello My Name is” idea! Aww these are cute! I did baby onesies too…they’re so easy and I love that there is no end to what you can do with HTV! I love all of these ideas but the “Hello, my name is…” so cute AND practical (especially for newborn twins)!!! I can’t find a link to download the free cut file. It says download your file HERE, but it doesn’t take you anywhere. Sorry about that Charli!! My link was broken but it should be all fixed now. Thanks for bringing it to my attention!! Oh, I NEED to make that “hello, my name is…” shirt! That’s SO SO cute!!! Where can I find a shirt like this ? The hello my name is snap shirt? Personalized baby clothes are always my first choice for the gifting purpose to the baby and this thing is very effective in making event more memorable for long time.